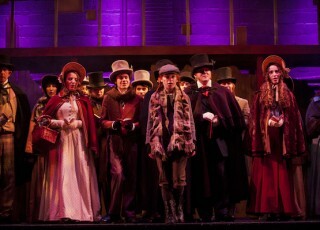 It seems hard to believe that A Christmas Carol is in its 27th year of being directed at Civic Theatre in Allentown. The show has evolved over the years, most notably on the number of actors, from a mere 31 when it started in 1989 to over 100 in today’s production. For many in Lehigh Valley and beyond, this is a yearly performance they attend with family and friends. For me, this year was going to be an extra special production because my 16-year old step-daughter to be, was making her first appearance as part of the street ensemble. It was weeks of practice and listening to her sing carols in the house, but it proved to be well worth it. Last Friday, her father and I attended the show, and were extremely surprised by the quality and cast. The stage was rather simplistic, but the talent spoke volumes. I guess we really shouldn’t have been that surprised, as William Sanders, the director/choreographer/co-adapter, has been at it for 23 years. He has numerous awards and has been very committed to theatre and the arts in Lehigh Valley. Ebeneezer Scrooge, played by the returning Mark Domyan, did a superb job as well. And, his real-life wife, Patricia, joined him on stage this year playing Mrs. Cratchit. 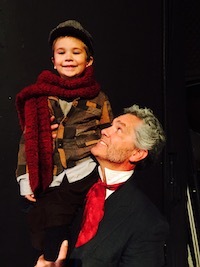 Tiny Tim, played by 1st grader, Lukas Barnett, was an adorable soul that nearly brought tears to your eyes at the end of the show. If you haven’t been to Civic Theatre, you don’t know what you are missing. The theatre has been in existence since 1927. Its grandeur remains, with the old-fashioned ticket booth out front with the bright lights to signal it’s a show day. The interior is quaint and has seen the light of many budding performers including Christine Taylor, Daniel Roebuck and Dane DeHaan. When you have an 89-year old building with 45,000 people attending performances each year, of course there are always needs for repair, which is why they are currently undertaking a $5.5 million campaign to restore its Art Deco charm. The Commonwealth of Pennsylvania is looking to match $2 million of the total cost to repair, but they still need the help of the public. Go see a performance. You won’t be disappointed. For a list of upcoming shows, click here. Become a member. This will entitle you to discounts on a multitude of things, as well as free popcorn on Member Mondays. Advertise in their playbills or onscreen. Rates start at $35/week. Become a Business Partner. Whether you sponsor a Mainstage Production, a Reception, or a Cinema Film, you could be eligible for a business tax credit. Flat out donate to the 501c3 nonprofit organization. You’ll get the tax deduction to boot! 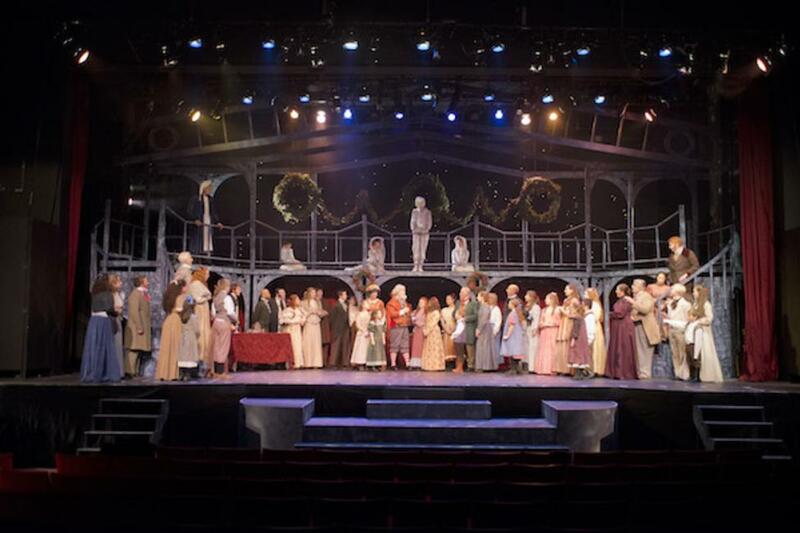 A Christmas Carol ends December 17, but you can catch other performances by visiting their website. Enjoy the show if you can make it, and please consider contributing to benefit this historic venue.